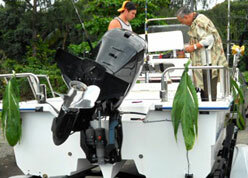 Kahu Silva performed a seldom seen Hawaiian blessing for a boat named Kahuoi at He`eia Kea pier on O`ahu. This sacred ritual is called “lolo ana I ka moku (imparting brains to the boat), was used by ancient kahuna (priests) to consecrate the launching of a new canoe. 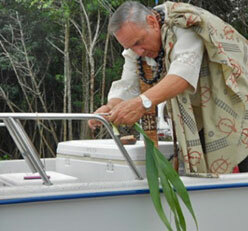 Today, Kahu Silva also performs this blessing for canoes, boats and other types of sailing craft. In accordance with cultural protocol, the ceremonial dedication commenced with a pule kahea (sacred prayer chant) to invoke the presence of the benevolent Hawaiian deities. Using a coconut shell filled with holy seawater and a lau ki (ti leaf), kahu performed the customary pi kai (sprinkling blessing) with the kōkua (help) of the boatowner, to spiritually sanctify the vessel and remove any taboo. As kahu encircled the boat, he called upon the Hawaiian akua and ‘aumakua (ancestral guardian spirits) to watch over, guide and safeguard the boat on its seafaring ocean voyages to and from Hawaii’s shores. Lau ki were also fastened to the four corners of Kahuoi for protection. The blessing ceremony concluded with the sharing of aloha and kahu saying, “E au ana ‘oe iloko o keia moku me ka palekana a me ke aloha o na Akua.” (You may travel inside of this boat with safety and the blessings of the heavenly ones. i have a son that has been getting spiritual problems that may be tied to his hawaiian given names. I would like your assistance.